The research appears Feb. 18 in Molecular Therapy—Oncolytics. The new study was conducted in human cells grown in the lab. According to the investigators, it demonstrates the possibility of directly delivering genetically engineered viruses to specific cells. The goal is to infect only cancer cells and then trigger the virus to replicate until the cells burst, killing them and releasing more of the targeted viruses. The scientists showed that unlike human antibodies or those of most other animals, the antibodies of camels and alpacas survive the harsh environment inside cells and retain the ability to seek out targets, potentially solving a longstanding problem in the field of gene therapy. 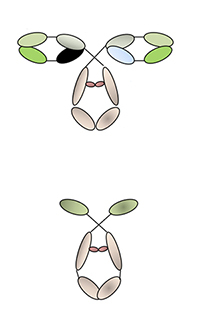 Typical antibodies (top) unfold in the harsh environment of the cell. Camelid antibodies (bottom) are smaller and more stable. Antibodies are proteins of the immune system that travel through the bloodstream and recognize potential threats to the body, whether bacteria, viruses or abnormal cells. Most antibodies have a characteristic Y shape. The tips of the Y form a “lock” that binds to a specific “key” carried by foreign bodies that the immune system should destroy. According to Curiel, recent work by other groups has identified an unusually small and stable class of antibodies made by camels, alpacas and related species collectively classified as camelids. The “lock” of camelid antibodies consists of the stem of the Y only, so it can’t unfold in the harsh internal environment of the cell. Currently available viral-based cancer therapeutics and those in human trials are not targeted directly to tumor cells. Indeed, these therapeutic viruses can infect almost any cell type. But they are genetically engineered to replicate only inside tumor cells. The viral DNA code is rewritten so that only tumor cells carry the molecular switch that activates the virus’s replication machinery. Once that switch is flipped, the virus replicates until the cell bursts, killing the cell and releasing more viruses that can potentially infect other cells. Limiting virus replication and cell death only to cancer cells is helpful in reducing side effects of the treatment. But the technology is still inefficient because so much of the injected virus never finds the tumor and is essentially wasted. After demonstrating this proof of concept, the next step is to design viruses with camelid antibodies against a specific tumor and test it in an animal model of the disease, Curiel said. This work was supported by the National Institutes of Health (NIH), grant numbers 5P50 CA101955, 5R01 CA154697; the Stichting Jo Kolk Studiefonds and the Dutch Cancer Society. van Erp EA, Kaliberova LN, Kaliberov SA, Curiel DT. Retargeted oncolytic adenovirus displaying a single variable domain of camelid heavy-chain-only antibody in a fiber protein. Molecular Therapy—Oncolytics. Feb. 18, 2015.